Ruth Bader Ginsburg became the second female justice of the U.S. Supreme Court. Born in 1933 in Brooklyn, New York, Bader taught at Rutgers University Law School and then at Columbia University, where she became its first female tenured professor. She served as the director of the Women’s Rights Project of the American Civil Liberties Union during the 1970s, and was appointed to the U.S. Court of Appeals for the District of Columbia in 1980. 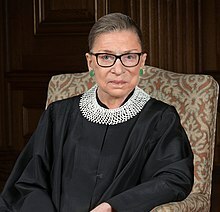 Named to the U.S. Supreme Court in 1993 by President Bill Clinton, she continued to argue for gender equality in such cases as United States v. Virginia. In 1996, Ginsburg wrote the Supreme Court’s landmark decision in United States v. Virginia, which held that the state-supported Virginia Military Institute could not refuse to admit women. In 1999, she won the American Bar Association’s Thurgood Marshall Award for her contributions to gender equality and civil rights.